One of the country’s e-business service providers, eOneNet.com, is expecting a better business environment this year, with growth being fuelled by the strong performance of online retailers in the US which has turned profitable. “With more consumers going online, better security and more consumers making purchase online, we will see more traditional companies launching their internet stores and increasing their information and communications technology (ICT) spending to capitalise on the huge online market,” said eOneNet.com president and chief executive officer Fione Tan. Because of the new developments in the e-business sector, Tan believes that more companies will set up their presence online. Companies already having websites would be focusing on improving the customer experience and value-addition that they are able to provide online. On which sectors of the industry will be the heavy spenders in ICT, Tan said she expects them to be the banking and telecommunications sectors. eOneNet.com thinks that as more of these companies reposition their image as a “high technology, Internet focus”, they would spend more on online marketing towards capturing this target audience. Overall, eOneNet says ICT companies will have good growth potential if they remember to focus on their target market. For instance, companies offering product and service suited towards countries like China, where the need for IT products and internet is climbing steadily, will be exposed to greater market demand, and thus have higher growth rates. 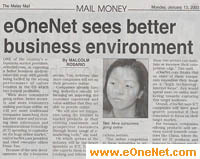 "eOneNet sees better business environment - The Malay Mail"